Tattoos are beautiful expressive tools that provide us with number of options to explore our creative side and give them a shape. The world is full of variety and this very variety finds a place in the form of different languages and scripts that are present on the globe in its different corners. Tattoos also draw inspiration from the scripts and it is very fashionable and cool to get tattoos in various scripts. 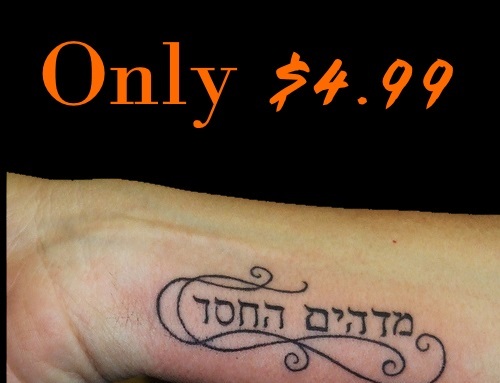 Hebrew tattoos are also a part of this language category art form. Hebrew is one of the most ancient languages of the world which is considered by Jews to be their native language. The script has undergone a deep evolution in the course of time and today it is written in a standardized form. Many people find the language fascinating and for them, Hebrew tattoos are a good way to show their love and respect. Many people also get these tattoos as a tribute to the holy Jewish land where Lord Jesus was born. Those who go on trips are often seen getting the tattoo as a souvenir. If you are interested in knowing more about the Hebrew tattoos, then take a look at this post which has 30 images to tell you a lot. Go ahead and enjoy. If you liked our selection, perhaps these other posts will interest you too, Literary Tattoos, Chinese Writing Tattoos, Chinese Symbol Tattoos and Tattoos With Meaning. Cool Hebrew script tattoo, carved on the side of the chest, that is simple and clean in appearance. Holy Hebrew words carved as wrist tattoo, that say “be very courageous and strong” inspire the wearer to be bold and brave. Symbolizing inner strength, this Hebrew tattoo serves as a source of inspiration to the wearer and she also finds it worth flaunting. This big back tattoo has the holy “trinity” name carved in Hebrew that is meant to protect the wearer from evils. Simple name tattoo that is inspired by the Hebrew prophet who spent his life as a captive at the court of Babylon. The girl got this Hebrew word meaning love, carved on her wrist to remind herself of god’s grace. The vertical trail has a Hebrew script that is flawed because the script is written from right to left, not the other way. Carved in wrong fashion, this Hebrew tattoo, which was to mean “life”, is now devoid of any life but looks pretty, all the same. Lovely father expresses love for his daughter with her name tattoo, carved in Hebrew, on the neck. Stomach tattoo, carved in neat and bold style, displaying the surname of the wearer that means music in Hebrew. The girl has got the meaning of her name carved on the back that means “protected by god” in Hebrew. This tattoo with rest of the portion on other arm says “where there is no vision, the people go wild; but he that keeps the law will be happy”. The boy shows his love for the language by getting his name carved in Hebrew on the inside of the forearm. Meaningful and magnetic; this Hebrew arm tattoo, forming a circular design on the arm, says “never forget”. This Hebrew tattoo pertains to the name of a god called Esh Okhlah and means “consuming fire”. Hebrew tattoo carved in Jerusalem as a souvenir, to commemorate the trip the wearer went on, that says “khokhav” and stands for a star. The smiling girl is a devout believer in Jesus and to express the same she has got a Hebrew tattoo that says “take the world, give me Jesus”. The man has got a long, half sleeve, Hebrew script lettering tattoo that is not exposed often and lies hidden. The Bible has around 8 to 10 names of locusts in Hebrew and this vertical back tattoo alludes to the same.